Above are our members enjoying a covered dish dinner to kick of the new year for us! 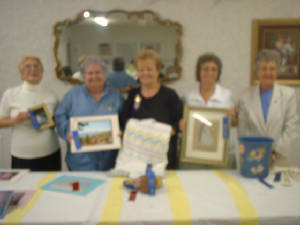 Below are our Blue Ribbon winners in our annual arts and crafts show, these ladies will now move on to our district contest, and from there on to the state level. Good Job Ladies!! Above are members of GFWC-WV working on the special project during our summer conference. 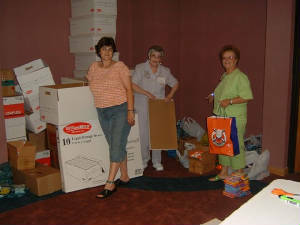 We filled 37 boxes with school supplies that were donated by the women of GFWC-WV. They were presented to Special Education Teachers in Braxton county. 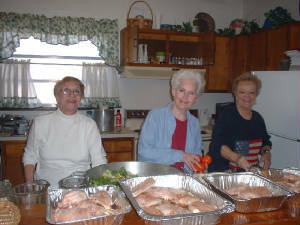 Below are 3 hard working ladies preparing a meal for 62 hungary square dancers. this was a project we did to raise funds for our community Improvment. 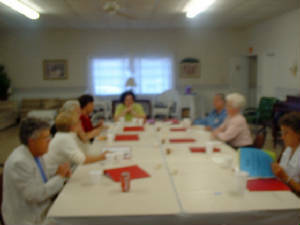 The dancers had a choice of baked stake, or baked chicken, they ate and chatted, then enjoyed hours of square dancing in our club house. Our Fall Rumage Sale was a sucess, lots turned out to buy and haggle. We appreciate the support we get from our Community. 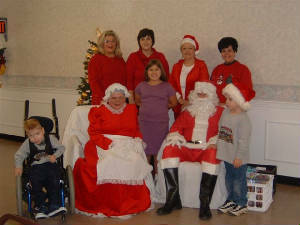 Breakfast with Santa is a project that is done every year in our community, and everyone looks foward to it. Along with Tudors Biscuit world, we have able to serve sausage biscuits , and juice, along with Mr. and Mrs. Santa Clause for the Children of the community. each child brings in a can of food for our local food pantry. 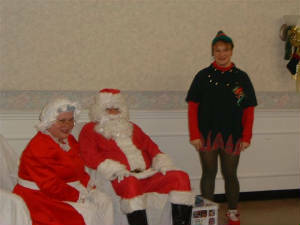 This year at Breakfast with Santa we served 75 children, and Santa gave them treat bags filled with goodies. 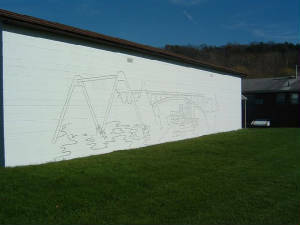 This is the side of our club house,, until recently it was a blank white wall. we contacted a local artist and he drew out a plan for us, in this picture it shows the works of our club that has occured over the last 70 years. Women of our club have worked hard at improving our community, and this is our way of showing a view of what we do. With this picture we hoped to brighten up this shab side of our club house while at the same time giving our community a glance of the history, present, and future of GFWC-WV Womans Club of Nitro.